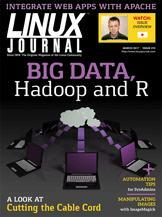 Big Data analysis in less than an hour: create a Linux cluster, analyze data and destroy the cluster. Make your third-party web applications accessible through an existing Apache installation. Shawn Powers' The Open-Source Classroom The Post-TV Age? Doc Searls' EOF The Problem with "Content"